If you’re considering selling your North Shore home this summer, you may be wondering how to make your home stand out from the competition. Given the current buyers’ market, you’re aware that those looking to buy a North Shore home have a wide variety of beautiful homes from which to choose. So, what exactly are buyers looking for in their new North Shore home? As an experienced North Shore Real Estate agent working in Winnetka, Glencoe, Highland Park, Northbrook, Deerfield and other North Shore communities for a number of years; I’ve seen the ebb and flow of trends of what appeals to buyers. Yet there are some timeless features that always remain the same. Below is a good mix of both classic and modern features that you’ll want to consider as you sell your North Shore home. 1. Nice Entryway- The entryway will create a first impression of your home. One that is attractive can give buyers a good sense of how you’ve cared for the rest of your home and will make them anxious to see the rest! 2. Hardwood Floors- Well maintained hardwood floors are always a favorite amongst buyers. There’s a classic appeal as well as undeniable quality to real hardwood floors. 3. Nice Fixtures- It’s easy for fixtures to become outdated, but these changes are some of the most inexpensive upgrades you can make to your home. Take note of current trends in fixtures and make these updates so that buyers feel your home is more move in ready. 4. Beautiful Bathrooms- North Shore buyers will be looking for features in the bathroom such as dual vanities, a soaker tub and even upgraded countertops. If your budget doesn’t allow for these major renovations, simply updated the large sheet mirror and lighting can make a big difference. A nicely framed mirror and elegant sconces have greater appeal and add warmth to the bathroom. 5. Countertops- While granite seems to be what every buyer is after, the main appeal is really the slab. Buyers don’t want to see grout lines that will be hard to keep clean, so whether you’re going with concrete, limestone or marble, get the full slab. 6. Stainless Steel- Buyers love the look of stainless steel because it looks professional. While it’s not a necessity; it is appealing for many North Shore buyers. It will be worth the upgrade. 7. 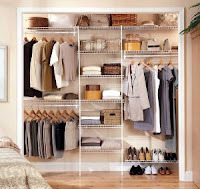 Pre-organized Closets- Closet organizers give the impression of an easy to keep clean closet. It’s those small details that will make your North Shore home stand out! 8. Lighting- If your home doesn’t get a lot of natural light, consider installing recessed lighting or new sconces. Buyers don’t want to have to worry about how they’re going to brighten up a darker space. 9. Built-ins- While this is one upgrade you won’t likely put in your home if they’re not already there, buyers appreciate this “free furniture.” Well-crafted bookshelves or entertainment units can give the home the feeling of being built with quality in mind. 10. Nice Lawn- If you have a nice, flat lawn; don’t feel the need to add to it! Oftentimes North Shore buyers have children or pets that will want to take advantage of a great lawn. Of course you’ll want to be sure your lawn is well-manicured and ready for the new owners to come in and enjoy. I hope that these things to consider are helpful as you prepare to sell your North Shore home. If you have any questions about putting your home on the North Shore Real Estate market or are ready to get started; please feel free to contact me today!